Engineering research plays a transformational role in determining the well being of our planet and the prosperity of its people. 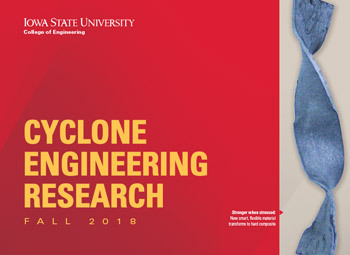 At the Iowa State University College of Engineering, we continuously strive to be leaders in transforming the results of scientific research into engineering accomplishment, creating new solutions to society’s problems. We emphasize a collaborative, interdisciplinary approach that delves into initiatives aligned with our signature research areas, listed below, that bring together the exceptional capabilities and expertise of talented faculty, staff and students.